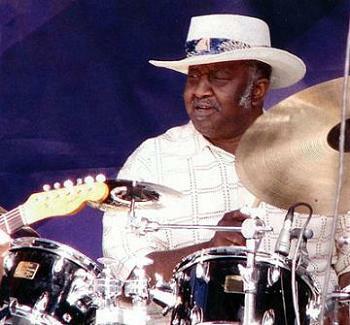 Born in 1939, Bernard "Pretty" Purdie is a pioneer drummer in the fusion of blues style, funk, Rythm'n'blues and jazz (evidenced by the prestigious list of artists with whom he worked). He started playing the drums at 14 years old in the carnival and country bands, and performed in New York in 1960, but it was not until 1970 that he really makes himself known alongside a "star": Aretha Franklin, which propels his studio drummer career after playing with many luminaries of jazz and blues. He is famous for a style of playing now called the "Purdie shuffle", which consists in introducing a flow of embellishments (ghosts notes, shuffle with the four limbs, playing with alternating strokes, roll, chabadas, etc.) around a beat and afterbeat in two beats of the most simple. The subdivision of each beat in 9 equal beats (triplets of triplets, what I call the "double swing" (examples: "It's a man's man's man's world", James Brown, 1966, "Nina Simone Sings the Blues", 1967)) for the "very slow blues" could be one of his inventions as well as the "half time shuffle" (division of each beat in 6 with two triplets groups, or "swing rock" ("Coffee Cold" album "Shapes of Rhythm", Galt MacDermot, 1966)). His shifts in 3 over 4 on ride cymbal (in mixed sticks and in the spirit of New Orleans or even samba) inspired surely David Garibaldi and Jack DeJohnette. The pioneers of heavy metal such as John Bonham, Carmine Appice and Ian Paice, and jazz-rock and progressive rock as Mitch Mitchell and Ringo Starr was probably inspired by his playing (Bernard was also perhaps in turn inspired by Mitch Mitchell, unless all these drummers have had the same avant-gardist ideas almost simultaneously). 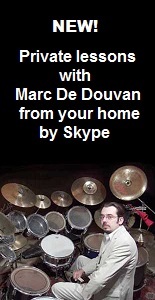 Contemporary drummers like Steve Gadd, Jeff Porcaro or Dennis Chambers, owe him a lot. His style combining clarity and discreet complexity, earn him to be appreciated by musicians from the most popular to the most sophisticated, to be one of the most recorded drummers in history (over 3,000 albums!) and copied by all the best current drummers of blues and R & B (or even pop, jazz-rock and metal), demonstrating the avant-gardism of his playing.